There is evidence that those who play by the book – get a college education, follows the ABC’s of Successful Business, doing all the right things will have great success. There is also evidence that people who never even looked at a book, who never finished high school, and who started their business with $4.00 in their pocket – making choices solely based on their intuition, also have enormous success. We know people with Graduate Degrees in high finance plummet in their career, as well as those who didn’t finish school. It’s not about education, it’s not about finance, it’s not about status… It’s about one’s passion, dedication and willingness to follow through regarding their convictions. It’s about the heart and soul of any individual who is inspired to take what they do seriously enough to choose to create a business of selling their services or products – if that’s what they are inspired to do. There are millions of people who sing, paint, dance, create and invent, support and serve, because it’s what they love to do. They have no interest in turning their hobby or volunteer efforts into a career of any sort. This is good to know. They do what they do because they love to do it – it’s fun! There are millions of people that desire to turn their hobbies into a career – either working for other people or striking out on their own – starting from scratch, building their empire one stone at a time. Why? Why not? It’s fun! 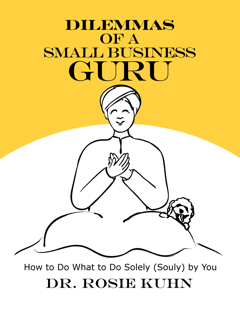 The intention of Dilemmas of a Small Business Guru is to empower you to think for yourself – inevitably deferring to no one regarding the direction and the unfolding of your business. Within these pages, videos and audio files, you will be exposed to other people’s stories and dilemmas, and that which is underlying every single dilemmas. This hopefully will empower you to ask yourself questions – what’s stopping me from choosing to choose? Or what’s stopping me from hiring a coach or thinking partner, who will empower and support me in creating the business that I want to create – just the way I want it! You might be saying – “It can’t be done. No one gets to have it the way they want.” Those who say they can’t, will never give themselves the opportunity to even try to have what they want. They allow their limiting beliefs and their fears to dictate what’s possible and what’s impossible. 8 out of 10 businesses fail these days. You can look up the top 10 reasons business’s fail, and what you will find is that, at the beginning, the founder of the business did not focus on the underlying foundations and principles of their own life, and their own truths. They were unwilling to lay down clear, defining vision – why they were doing what they were doing. They were not clear on their personal and professional values. They did not walk their talk. They were unwilling to get the kind of support that would guarantee them success. They fudged their integrity for the bottom line. Whatever it is you are doing for love or money, it is serving a higher cause or value. And that higher value, more likely than not, is serving even a higher value. Distinguishing your absolute highest value, your highest truth and the highest contribution you are serving inspires you every day to live into that. It took me six years to find my own highest truth – My vision statement says it all: The fulfillment of the human spirit through the empowerment of every individual on the planet. This statement inspires me to get me up in the morning, and it inspires me to live into the practice of fulfilling the human spirit – mine and others. Am I completely successful at living into this vision? No. However, I’m compelled to keep at it. Dilemmas of a Small Business Guru empowers you to explore what it is that is your highest values, and to discover conflicting beliefs and values that undermine your unlimited potentiality. Watch for the videos and podcasts Dilemmas of a Small Business Guru. You will be introduced to people like you, who are running their own business and facing all sorts of dilemmas that will be familiar to you! Consider bringing me on as your thinking partner as you face certain dilemmas of being a business guru. I guarantee, that having someone empowering you to empower yourself will bring effortlessness to being the fulfillment you desire. Email Me!